The number of executions and the size of the death row population (those awaiting execution) has ballooned since the restoration of the death penalty in 1976. 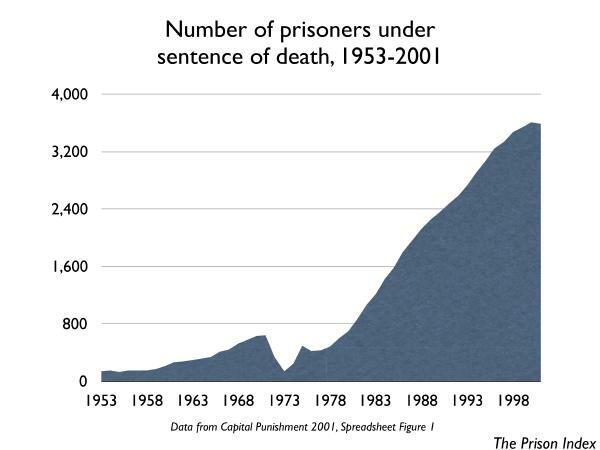 But the situation is subtle; more so than the graph (following) illustrating the size of death row suggests. The graph's mid-1970s depression represents the period between the 1972 Furman v. Georgia decision that declared existing death penalty laws to be unconstitutionally "arbitrary and capricious" and the 1976 Supreme Court's upholding of the new death penalty laws in Gregg v. Georgia. Encouragingly, the number of new arrivals on death row in 2001 was the smallest number since 1973: 155.11 The number of executions in 2001 was down from the 1999 peak of 98, to 66. As of mid-December, 68 executions had been carried out in 2002. 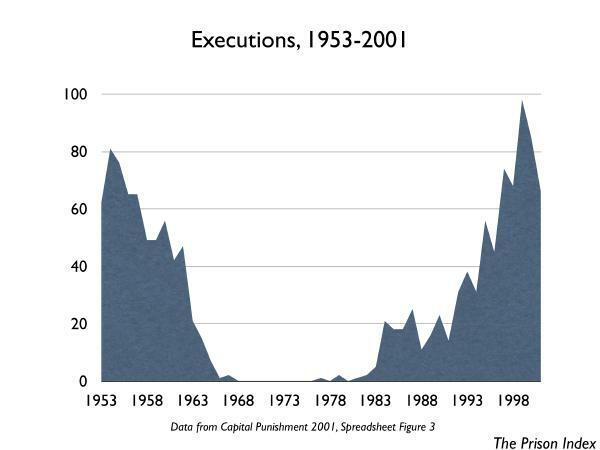 A graph of the number of executions, while smaller than the number of people on death row, tells a different story. Implementation of the death penalty had become quite rare (at least compared to the size of the death row population) prior to the 1972 Supreme Court decision. There were 5 executions in 1965, 1 in 1966 and 2 in 1967, and no more than 2 per year until 1983. Making future predictions based on these graphs is complicated not only by the evolving moral and legal views on the death penalty, but by the long delay between changes in the law and a resulting change in the number of death sentences and executions. The 1996 Anti-Terrorism and Effective Death Penalty Act limited the number and type of appeals a death row prisoner can make. Not all of these changes apply retroactively, but all are expected to decrease the amount of time an execution may be postponed while the sentence is appealed. The 1996 Anti-Terrorism and Effective Death Penalty Act made more crimes eligible for the death penalty, countering a trend started in the 1950s to make the death penalty apply to a narrower and narrower list of crimes. The terrorist attacks of September 11th may have created a more punitive mood in government and the population. 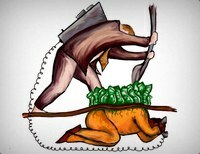 President Bush's November 13, 2001 executive order authorized secret military tribunals to try suspected terrorists and impose the death penalty without the usual due process protections of U.S. courts. The DNA exoneration scandals, where DNA evidence has conclusively shown that the innocent were wrongly convicted, has cast public doubt on the finality and infallibility of the death penalty. A number of states have declared or are considering a moratorium on the death penalty until the DNA issues can be resolved. Increasing attention to the racial disparities in death sentencing has caused a number of states to enact or propose moratoriums on executions. In June 2002, the Supreme Court invalidated the death penalty laws of several states that allowed a judge and not a jury to impose a death sentence. An estimated 180 to 800 current death sentences will be converted to life sentences, reducing the current death row population. In June 2002, the Supreme Court ruled that executions of the mentally retarded violate the 8th Amendment. This decision is expected to remove a number of prisoners from death row and prevent defendants with mental retardation from being sentenced to death in the future. The number of countries without the death penalty is growing and many countries refuse to extradite suspects to the United States without a promise that the death penalty will not be applied. 11 Bureau of Justice Statistics, Capital Punishment 2001, p. 9. 12 American Bar Association Juvenile Death Penalty Initiative http:// www.abanet.org/crimjust/juvjus/juvdp.html. 13 Death Penalty Information Center Year End Report 2002, p. 2, 6.